I created this for a party recently and it was met with a rave reviews. 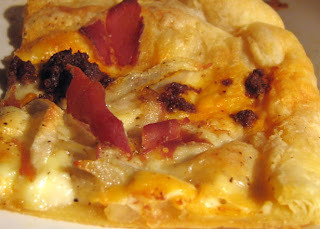 This is a version of a French recipe for caramelized onion tart. Using frozen phyllo dough makes this pretty simple. It is tough with only one hand because the dough needs to be rolled out, and the onions need to be sliced- but if I can make it with one hand in a cast, you can surely make this with two! A rich tart that makes a super great appetizer or a nice dinner option paired with a simple salad. 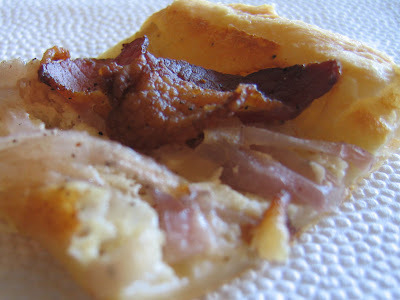 I made two tarts, the photo is a second one I made in which I used less onions and also added some chorizo and few other random left overs in it- my preference is for the simple bacon and onions one but feel free to try out your own options. salt and lots of fresh ground black pepper. You can have the above steps done ahead of time and just assemble before your party for ease. Roll out your phyllo sheet, use your cookie sheet pan as your guide- so know how wide to make it (length wise it won't be as long or it might get too thin). Take the outside edge and just roll and pinch in about 1/4 inch of dough to form and edge around the tart. Transfer each dough to a seperate sheet pan. Use a fork and poke holes in the base of the dough, to help keep it from bubbling up. Top with the onion bacon mixture and bake until the outside crust is brown and puffy. (375 degree for about half an hour.) Serve warm or room temperature.